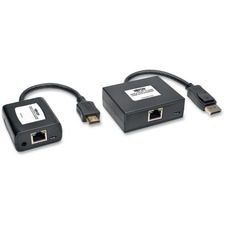 Active extender kit includes a transmitter unit and a receiver unit that work in tandem to convert a DisplayPort audio/video signal to HDMI and then extend it to a projector, monitor or television up to 150' away. Kit is capable of extending a high-definition 1080i (60 Hz) signal up to 150' and a 1080p (60 Hz) signal up to 125'. Green and orange LEDs on both units indicate when they are receiving power from the USB Micro-B cables and sharing a signal for quick reference. Universal design is compatible with all operating systems. Hassle-free functionality does not require an external power supply for immediate use. Plug-and-play technology makes installation quick and simple, with no software or drivers to install. Kit supports 24-bit True Color (8 bits per channel) and stereo audio. Extender kit is perfect for digital signs, trade shows, presentations, classrooms, churches and more. 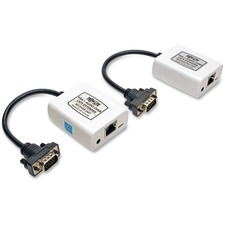 Passive extender kit lets you extend a 1920 x 1080 signal up to 50', or a 1024 x 768 signal up to 100'. Universal design is compatible with all operating systems. Plug-and-play technology makes installation quick and simple, with no software or drivers to install. Hassle-free functionality does not require an external power supply for immediate use. Short range extender kit lets you extend a 1440 x 900 video/audio signal up to 150', or a 1024 x 768 video/audio signal up to 300'. EDID copy feature stores the monitor's EDID information and sends it to the connected computer to allow optimal display compatibility. 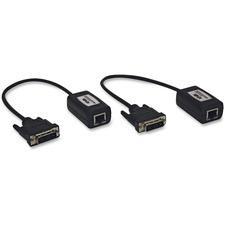 Power is supplied through the included USB Micro-B cables to eliminate the need for an external power source. Plug-and-play technology makes installation quick and simple, with no software or drivers to install. Equalization and gain controls allow you to quickly adjust the video image to ensure you maintain a consistent signal. Audio connections are made with standard 3.5mm stereo cables (sold separately) at both the transmitter and receiver. Extender kit is perfect for digital signage installations for retail, schools, churches and more.